How can you tell a good Bond film from a bad? I don’t think I’ve seen a really bad old Bond film, or at least, not one that was worse than any of the other Bond films. 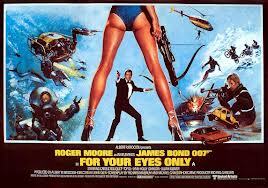 This was my first Roger Moore. I can definitely see why he is the favourite Bond for many – he is allowed to look fearful and panic, but the second he gains any control, he’s back. Cool, smug and cheekily arrogant. A boat of the British army has been sunk, with the revolutionary ATAC system on board. The boat is traced by a marine biologist who is then assassinated along with his wife, in front of his beautiful daughter, Melina. Melina gains revenge on the killers, but of course, the plot is deeper than that. Bond finds the ATAC system only to be thwarted by the bad guy. Escaping from sharks and with an extremely conveniently oxygen tank left beneath the sea, Bond eventually comes out on top. Cheesy lines, terrible vocal dubbing and the death of many beautiful woman, it is marvellous. Long (over two hours long) but marvellous.